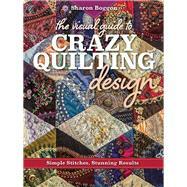 Sharon Boggon trained in fine arts and developed great skill in contemporary embroidery and crazy quilting. She teaches internationally and online and has also lectured on textiles at the Canberra School of Art. Sharon lives in Canberra, Australia. Using Beads, Sequins, and All Those Fun Shiny Bits! Don't Forget to Add a Spider!